We don't have full details quite yet, but from what we've heard you're looking at a 3.8 liter flat six that revs to 9,000 RPM. Power should be comfortably more than 400. Which sounds swell. 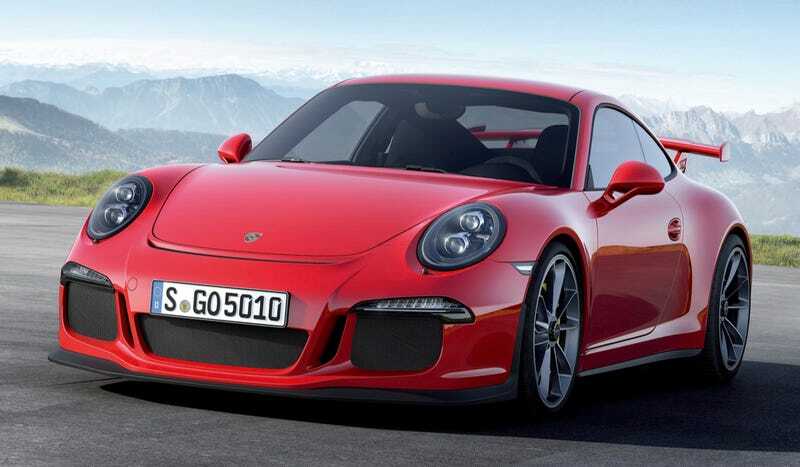 It doesn't have a manual gearbox, but the PDK is supposed to be unbelievably fast and all new for this GT3. We'll live. We'll be sad. But we'll live. The wraps are being pulled off officially tomorrow at the Geneva Motor Show. Color us so excited. UPDATE: It redlines at 9,000 RPM. It has 475 horsepower. It has rear-axle steering. It gets to 60 in 3.5 seconds. It's made me collapse with excitement.